Mr. Pouillon enjoying a laugh. When I first heard of the recent murder of pro-lifer Jim Pouillon, I thought the name was familiar. When I saw a picture, I remembered. 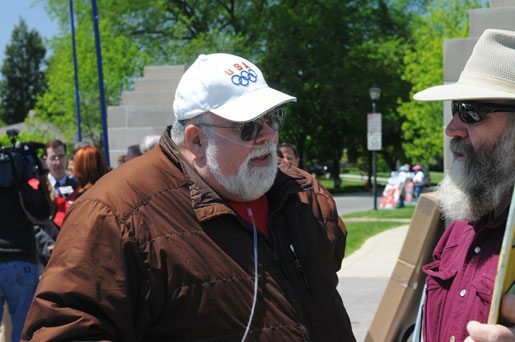 I met Mr. Pouillon at the University of Notre Dame back in May when activists from around the country went to protest against the honoring of a pro-abortion president at a Catholic university. 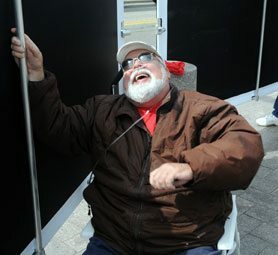 Mr. Pouillon, sitting down in his old lawn chair hooked up to his oxygen tank, was holding a sign showing the horrors of abortion. I was covering the event as a photographer when he motioned me over. I thought, “This man certainly looks interesting,” as I walked to him. Interesting he definitely was. He asked about the TFP and I filled him in about our activities, highlighting the many things done in defense of the unborn. When I asked him about himself, he briefly filled me in on his pro-life activities. Only now do I realize how active he truly was. Reading articles about him, I found he protested abortion on a regular basis for the last twenty years! When I heard of the murder, I wondered why someone who supported abortion could take into his hand the role of judge and assassinate a peaceful protester. In fact, violence against pro-lifers is not something new. There are many documented cases of attacks on pro-lifers by pro-abortionists.1 Mr. Pouillon’s murder is the face of radical pro-abortionists who do not tolerate opinions contrary to their own. We have to face it. Abortion alone has killed over forty million American children, forty million separate acts of violence and murder. When a society embraces such a moral wrong, what prevents it from actively promoting other moral evils such as euthanasia or eugenics? Mr. Pouillon, a Catholic, did something very interesting some time after our conversation together. A group of anti-Catholic fundamentalists were roaming about the protesters shouting anti-Catholic slogans. Mr. Pouillon rose from his chair and walked over to one of them and said something only the man could hear. The man looked at Mr. Pouillon and then walked away. I think this is a good example of who Mr. Pouillon was: a man not afraid to stand for his Faith and his principles. Thankfully, there are many Americans who, like Mr. Pouillon said, are willing to stand up and fight for principles. Mr. Pouillon gave his life for his principles, and serves as an example for all of us. I know I can say that I am proud to have met a man like Mr. James Pouillon. This entry was posted in News Commentary by Jose Walter Ferraz. Bookmark the permalink.